TelfaTM Island Dressings are a convenient and easy to use all-in-one dressing Kendall. They have a soft, non-woven backing that conforms around wound and seals on all four sides. These dressings are bonded on both sides with a perforated non-adherent film that can be cut to fit to any shape without separating. Kendall Tefla Island Dressing Features a polyester wound contact layer film polymer. The film has 382 holes per square inch with a diameter of 0.020 to 0.030 inch. 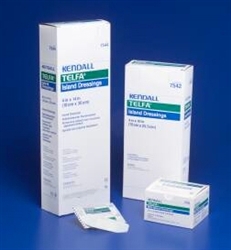 This has been tested to provide the perfect balance of non-adherence and exudate management. In addition, the absorbent core is made out of 100% USP grade absorbent cotton to help minimize skin maceration. The Tefla Island Dressing provides an ideal moisture vapor transmission rate. This helps control the fluid loss and provides a moist wound-healing environment.